Taking time to connect with a lush and ancient rainforest world is a gift for the mind, body, and spirit. In addition to this meaningful motivation, here are six other reasons to get up to Lamington National Park for a night or more. In south-east Queensland and part of the Gondwana Rainforests of Australia World Heritage Area, 21,176-hectare Lamington National Park is a magical world of subtropical and temperate rainforest, ancient trees, dramatic lookouts, and spellbinding waterfalls. The park has two sections, each with lodging, camping, walks, and other facilities: Green Mountains, on the western side of the Lamington Plateau, and Binna Burra, to the east. Here are six ways to deepen your connection to the rainforest while there. At dusk, red-necked pademelons – small marsupials with a reddish neck and shoulders – forage in front of Grooms Cottage at Binna Burra Lodge, as well as in the grassy area behind O’Reilly’s Rainforest Retreat. Observing this adorable nocturnal species is a wonderful excuse for spending the night, and you’ll also likely spot them if you go for a short bushwalk in the late afternoon or early morning. Red-necked pademelons are a common sight in Lamington National Park, particularly at dusk and dawn. As you wander the park’s trails, listen for the 230 species of birds that live here: for example, kookaburras, eastern whipbirds, catbirds, and the seldom-seen, ground-dwelling Albert’s lyrebird, which mimics a number of calls, including whipbirds, bowerbirds, and rosellas. O’Reilly’s Rainforest Retreat, in the Green Mountains section, is a particularly enticing place for birdwatching. Join the retreat’s daily, early morning birdwatching walk (free for guests) and spot regent and satin bowerbirds, eastern yellow robins, blue fairy wrens, Wonga pigeons, and more. Later, purchase birdseed, which will probably inspire crimson rosellas and king parrots to perch on your head and shoulders as they await a snack. O’Reilly’s also hosts an annual bird week, where bird enthusiasts attend presentations and workshops and scout for as many species as possible. The 21.4-kilometre Border Track links the Binna Burra and Green Mountains sections and is one of the park’s oldest trails. O’Reilly’s operates a Saturday shuttle to Binna Burra; from here, you can walk the entire Border Track back to your accommodation, climbing towards the McPherson Range’s misty, temperate rainforests and passing multiple overlooks en route. Other walks – some less than an hour, others requiring the better part of a day – radiate from the Border Track or commence close to park lodging. From Binna Burra, for example, the 17.4-kilometre Coomera circuit branches off from the Border Track and descends past multiple waterfalls before re-joining the Border Track for the final stretch. Antarctic beech trees (Nothofagus moorei) are similar to flowering plants that flourished in this part of the world 100 million years ago. Today, you can experience small pockets of these magnificent, mossy beauties in Lamington National Park (as well as in some other parts of the World Heritage Area). 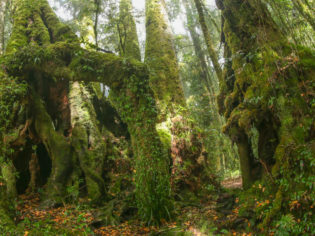 For example, the five-kilometre return Tullawallal circuit, which departs from Binna Burra, leads to a 2000 to 5000-year-old patch of beech forest, Australia’s northernmost example of the species. Surrounded and cradled by an ancient natural energy, you may find this a profoundly peaceful place to rest and reflect. For another fetching example, hike seven kilometres along the Border Track from O’Reilly’s. Here, the trees, with their gnarled, exposed roots (the result of erosion), have a mystical aura; touching their cool, mossy limbs, contemplate what they might have witnessed over Lamington National Park’s 103-year history… and well before that. Pete O’Reilly, nephew of Bernard O’Reilly, stands before the Stinson replica at O’Reilly’s Rainforest Resort. Image via Kara Murphy. In 1937, Stinson airliner VH-UHH crashed in the McPherson Ranges with two pilots and five passengers aboard. Although initial rescue efforts were focused elsewhere, 33-year-old Bernard O’Reilly, a dairy farmer who also worked at his family’s Green Mountains guesthouse, heeded local reports and set out on a solo search nine days after the crash. After a 30-kilometre journey on foot, he found the wreck and its two suffering survivors and quickly raced off to organise a rescue party. Today, you can walk in this hero’s footsteps by signing up for one of O’Reilly’s guided Stinson walks. Both options are challenging: the 37-kilometre Bernard’s Footsteps route travels much of Bernard’s arduous course and requires a swift pace, while the 14-kilometre return Rescue Route, which begins and ends at Christmas Creek, entails a steep, 700-metre climb to the wreck. Whichever route you choose, you’ll gain a deeper understanding of Bernard’s journey and the rainforest’s unforgiving terrain. Keep in mind, though, that extensive bushwalking experience and a high level of fitness are essential – make sure to review the fitness requirements before signing up. Thirty years ago, Peter O’Reilly (Bernard O’Reilly’s nephew) realised his dream of creating Australia’s first tree top walk, where visitors could venture 15 metres above the forest floor to observe rainforest flowers, fruits, and birdlife. Today, you can still explore the rainforest canopy from this free, 180-metre-long structure, which is part of an easy 800-metre return walk from O’Reilly’s. And, if you really want to test your nerve, climb an additional 15 metres from the elevated walkway to an observatory platform, where the views are even more sublime… and, of course, doubly dizzying.